Today we show you a nice photograph of a German Panzer IV (Pz.Kpfw. IV) with a part of its crew. This is a Ausf.C, the third variant of the series production (according to Ausf. A and B), which among other things on the still missing ball mount (Kugelblende) in the front of the tank structure and the short antenna deflector (Antennenabweiser) below the 7.5cm KwK. L/24 tank gun is recognizable. The Ausf.C was manufactured from October 1938 – August 1939 in a quantity of 134. On the basis of the stowage box already recognizable at the rear of turret, which was first introduced and retrofitted in versions A-E from March 1941, it can be seen that the photo must have been taken at least after March 1941. The vehicle apparently bears the usual coat of grey paint (RAL 7021) for this time. On the side of the turret, the symbol of the 8th Panzer Division can be seen in white color next to the opened loader’s hatch, as it was attached to its vehicles at the beginning of 1941 until the end of the war. The ‘Balkenkreuz’ is recognizable in its early version (white color) on the side of the tank structure. The gutter for the transferable radio antenna was partially painted over here. The inscription in white, below the observation flap on the turret side, indicates that this is a commemoration of a crew member (Obergefreiter Walther), who was probably killed in the spring of 1941 or 1940 (France). The exact date is unfortunately not recognizable. The pickaxe recognizable on the side wall of the tank structure next to the radio operator, officially does not belong to the basic equipment of the tank. Whereas the spade, mounted below the antenna gutter, seems to be missing. Although already outdated, a Pz.Kpfw. IV Ausf.C even was observed in photos in June 1944 on the invasion front in Normandy (21.PD in Saint-Martin en Fresnay). This illustrates the long durability, but also the lack of contemporary and modern technology at this time in the German armored force. 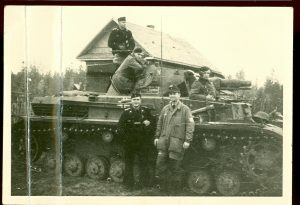 While the commander (presumably lieutenant) on the commander’s cupola wearing only the black tank uniform, the loader and the radio operator in the winter coat are recognizable. In front of the tank are two more soldiers. One of them might be another commander of another tank in the company. He is probably also a lieutenant and visibly carries binoculars. The other soldier is evidently a major of paratroopers whose rank is recognizable by the sleeve patch of the parachute blouse („Knochensack“). He already wears the field cap with a visor, which was officially introduced in mid-1943 and was previously used officially only in the mountain fighters and the troop in North Africa. The 8th Panzer Division was deployed from the beginning of April 1941 via Austria to Hungary and mid-April at Belgrade (Serbia) and Sarajevo (Croatia, now Bosnia and Herzegovina). After being refreshed in Tabor (Bohemia / Czech Republic), the division took part in the Russian campaign from June 22, 1941 and was deployed here in the area of ​​Daugavpils (Dünaburg). Despite the lack of information to the photograph, it is probable that the photograph shown here can be dated and assigned to use in the Balkans until the end of April 1941. More information and instructions are welcome from our team and can be added as a comment. Heute zeigen wir euch ein schönes Foto, das einen deutschen Panzer IV (Pz.Kpfw. IV) und einen Teil seiner Besatzung zeigt. Es handelt sich hierbei um eine Ausf.C, der dritten Variante der Serienproduktion (nach Ausf. A und B), die unter anderem an der noch fehlenden Kugelblende im Frontbereich des Panzeraufbaus und dem kurzen Antennenabweiser unterhalb der 7,5cm KwK. L/24 erkennbar ist. Die Ausf.C wurde von Oktober 1938 – August 1939 in einer Stückzahl von 134 gefertigt. Anhand des bereits am Turmheck erkennbaren Staukastens, welcher erst ab März 1941 bei den Ausführungen A-E eingeführt und nachgerüstet worden ist, ist erkennbar, dass das Foto zumindest nach März 1941 aufgenommen worden sein muss. Das Fahrzeug trägt augenscheinlich den für diese Zeit üblichen panzergrauen Anstrich (RAL 7021). An der Turmseite ist in weißer Farbe, neben der geöffneten Ladeschützenluke das Symbol der 8.Panzer Division erkennbar, wie es zu Beginn 1941 bis zum Ende des Krieges an dessen Fahrzeugen angebracht worden ist. Das Balkenkreuz ist in seiner frühen Ausführung (weiße Farbe) an der Seite des Panzeraufbaus erkennbar. Die Rinne für die umlegbare Funkantenne wurde hierbei teilweise übermalt. Die Beschriftung in weißer Farbe, unterhalb der Sehklappe an der Turmseite besagt, dass hier an ein Besatzungsmitglied (Obergefreiter Walther) erinnert wird, das vermutlich im Frühjahr 1941 oder 1940 (Frankreich) gefallenen ist. Das genaue Datum ist leider nicht erkennbar. Die an der Seitenwand des Panzeraufbaus neben dem Funker erkennbare Spitzhacke gehört offiziell nicht zur Grundausstattung des Panzers. Wohingegen der Spaten, unterhalb der Antennenrinne angebracht, zu fehlen scheint. Obwohl bereits veraltet, wurde ein Pz.Kpfw. IV Ausf.C sogar noch auf Fotos im Juni 1944 an der Invasionsfront in der Normandie beobachtet (21.PD in Saint-Martin en Fresnay). Dies verdeutlicht die lange Haltbarkeit, aber auch das Fehlen zeitgemäßer und moderner Technik bereits zu dieser Zeit bei der deutschen Panzertruppe. Während der Kommandant (vmtl. Leutnant) in der Kommandantenkuppel sitzend nur die schwarze Panzeruniform trägt, sind der Ladeschütze und der Funker im Wintermantel erkennbar. Vor dem Panzer stehen zwei weitere Soldaten. Einer der beiden dürfte ein weiterer Kommandant eines anderen Panzers der Kompanie sein. Er ist vermutlich ebenfalls Leutnant und hat erkennbar ein Fernglas umgehängt. Bei dem anderen Soldaten handelt es sich offensichtlich um einen Major der Fallschirmjäger, dessen Rang am Ärmelabzeichen der Fallschirmschützenbluse („Knochensack“) erkennbar ist. Er trägt bereits die Feldmütze mit Schirm, die offiziell erst Mitte 1943 umfangreich eingeführt wurde und zuvor offiziell nur bei den Gebirgsjägern und bei der Truppe in Nordafrika Verwendung fand. Die 8.Panzer Division war ab Anfang April 1941 über Österreich nach Ungarn und Mitte April bei Belgrad (Serbien) und Sarajevo (Kroatien, heute Bosnien und Herzegowina) eingesetzt. Nach Auffrischung in Tabor (Böhmen/Tschechien) nahm die Division ab dem 22.Juni 1941 am Russlandfeldzug teil und war hier im Raum Daugavpils (Dünaburg) eingesetzt. Trotz insgesamt fehlender Angaben zum Foto, kann man die hier gezeigte Aufnahme vermutlich auf Frühjahr, ca. bis Ende April 1941, mit Einsatz auf dem Balkan datieren und zuordnen. Weitere Angaben und Hinweise hierzu, sind von unserem Team gern gesehen und können als Kommentar ergänzt werden. Happy to bring it back to Germany and I put it in my collection. All the regiment cuff titles you see here are originals ! – For Officers the cuff title was hand embroidered in aluminum thread and featured the addition of an approximately 3 mm wide aluminum braid (Soutache) edging. 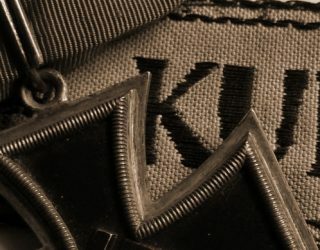 – For NCOs, the cuff title had machine embroidery made of matt gray or whitish-gray cotton and featured an approximately 3 mm wide cotton braid (Soutache) edging . – Although similar in material and color the version for enlisted men lacked the braid edging. 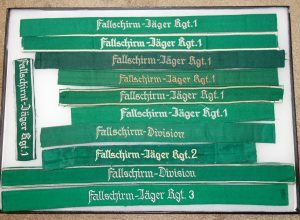 Very important to know is that the cuff titles of FallschirmJäger-Regiment 1 are the only ones were also cuff titles for enlisted men can be found which are HAND embroidered letters !!!! The cuff title was worn on the Tuchrock just above the turned back cuff of the right sleeve. 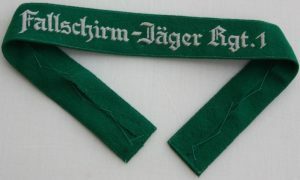 When worn by a soldier holding an appointment to the position of “Spieß”, it was attached just above the sleeve rings indicating this status. Officers also wore the cuff title on the Fliegerbluse and the white Summer Tunic. 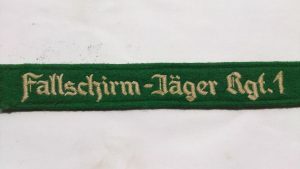 It`s evidenced by numerous photographs however, that the wearing of this cuff title was probably complied with less and less over the course of the war. Note: A formal date of introduction was not discovered for the cuff titles with the names Regt. 4 and Regt.5 . One explanation for this would probably be that when examples of this cuff title are encountered they are mostly of makeshift appearance, fabricated by the troops themselves. In the relevant cuff titles, the original numbers have been removed and replaced by a rather coarsely embroidered 4 or 5. The formation of Fallschirmjäger-Regiment 1 began on April 1st, 1938, based around IV. (Fallschirm) Bataillon from „Regiment General Göring“. The battalion, consisting of five companies, was the main battalion of the “Fallschirmtruppe” and initially formed 1st battalion of the regiment in Stendal, which was subordinated to 7th Flieger Division under General Student, in the context of plans for use in the Sudetenland. On September 1st, 1939 the former “Heeres-Fallschirm-Infanterie-Bataillon (Braunschweig)” joined the Luftwaffe as 2nd / 1 , and the “Luftlande-Bataillon General Göring“ (moved from Berlin to Gardelegen ) joined the Regiment as 3rd / 1. In March, the three battalions were intended to be used as part of the 7th Flieger Division in occupying the rest of Czechoslovakia, but due to bad weather they did not take part. After formation of a “Regimentsstab” in June 1939, Bruno Bräuer took over as the first commander of the regiment. During the Polish campaign some missions were planned for 7th Flieger Division , however they were initially not used. Subsequently during the campaign however, parts of the regiment were used in ground combat at Radom and Pulawy . In early April 1940, the 1st / 1 was prepared for use in Norway, where it went into action from April 9th, 1940. The German paratroopers took the airfields at Oslo-Fornebu and Stavanger-Sola and secured the Storstromme Bridge. Also the 1st company fought in the Dombas area. For use in Belgium in 1940, parts of the regiment were detached to “Sturm-Abteilung Koch”. In addition, 1st and 2nd battalion received the order to capture the important bridges at Moerdijk and Dordrecht . The 3rd / 1 was to occupy the airfield at Waalhaven, land a platoon on the outskirts of suburban Rotterdam-Feyenoord and capture the Rotterdam bridges. 3rd battalion achieved its goals, and the 1st and 2nd / 1 also fulfilled their duties, albeit with heavy losses. The days which followed were taken up in determined fighting to hold the positions which had been captured. The regiment contributed significantly and at the foreground of the successes of the paratroops in the western campaign. At the end of May 1940, the regiment was moved to Norway and supported the struggles in the Narvik area with General Dietl. After the conquest of the Balkans came the task of occupying the island of Crete, as part of operation „Merkur“. The regiment was employed in the 2nd wave, as part of “Gruppe Ost”, to occupy the city and airport of Heraklion. This task, after suffering heavy losses on the first two days of the operation (2nd / 1 lost about 400 men), could not be achieved and so the regiment was given the task of holding the enemy and preventing the use of the airfield. On May 29th, 1941 the airfield and the town of Heraklion were occupied after being evacuated by British troops. With this, the eastern part of the island also capitulated and 200 Fallschirmäger prisoners could be freed. Among the 3,094 fallen paratroopers were numerous members of Fallschirmjäger-Regiment 1. After the end of the fighting, the regiment was the first paratrooper unit to be moved back home and in August they arrived at the “Truppenübungsplatz” Bergen-Hohne. The 2nd / 1 was temporarily renamed as the “Fallschirm-Lehr-Bataillon” and the losses in Crete were more or less made up. Lake Ladoga on the northern section of the Eastern Front. The choice fell on Fallschirmjäger-Regiment 1, to take the place of the missing 2nd / 1, 2nd / Storm Regiment. With this action, the process began of removing the paratroops from their own specialist role and to use them as regular ground combat troops. 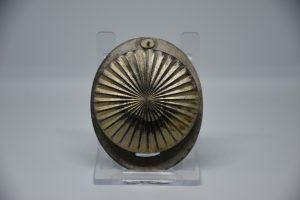 Subsequently, the remaining parts of the 7th Flieger Division were also used in this manner and thereby suffered severe losses because of often used being used in a fragmented manner. Having arrived at the limits of their combat effectiveness in late November a return home was warranted but the increasingly deteriorating situation on the eastern front prevented this. Only in May 1942 was the refresh of almost all units carried out in Normandy, where the Regiment was given a new 2nd battalion. 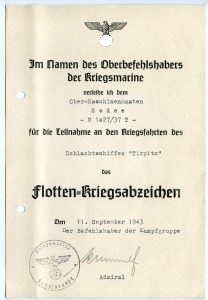 In mid-October 7th Flieger Division moved into the area of “Heeresgruppe Mitte”. In January 1943, the 3rd / 1 was moved into the Welikije Luki area, there to relieve an encircled “Kampfgruppe” at temperatures of -43 ° C. After a few quiet days bivouacked there, there was a major enemy attack, which the battalion withstood and was returned to the 7th Flieger Division on January 16th 1943. A short time later came an alarm involving the whole regiment near Orel, where it was replaced in March 1943 after the position was stabilized. Between February and May 1943, 7th Flieger Division was renamed as 1 Fallschirmjäger-Division, into which Fallschirmjäger-Regiment 1 was also absorbed. At the end of April the Division was assembled in Normandy and was then relocated in May / June to southern France. The Division was located in the Rhone Valley. In March 1944, 3rd / 1. had been removed and used in the formation of the 3. Fallschirmjäger-Division. It was subsequently reformed. In July 1943 came the action in Sicily, where a move of Fallschirmjäger-Regiment 1 by rail was carried out. During this movement, the regiment was stopped and moved into the area Eboli to be used in case of a possible Italian withdraw from its alliance with Germany. In September the Regiment came under the control of its division at the Allied bridgehead at Salerno and then at Cassino. The regiment earned a legendary reputation there, but was eventually forced to retreat. In June in the area around Rimini, the regiment was one of the last German units to cross the Po. Withdrawing to the Alps, the Regiment rejoined the rest of the Division on May 2nd, 1945. Hope that the Fallschirmjäger-Regiment 1 information was good for your hobby! Subscribe for more and get an email every time a new article goes online ! Help us on Facebook to get to collectors all over the world !! With today’s photo we show a beautiful soldier portrait. This is the picture of the German paratrooper Heinz Besecke. He began his service in early November 1937 at the (Flak) Regiment General Goering and was subsequently a member of the 2nd Company, 1st Battalion of the Fallschirmjäger Regiment 1. Its unit was involved among other things in the occupation of the bridges of Dordrecht in Holland in May 1940. In the meantime, relocated to Trondheim / Norway at the end of May 1940, from May 20th to 29th, 1941, the operation took place in the conquest of the island of Crete. He wears the typical uniform of a paratrooper at that time. Striking here is of course the colloquially referred to as „Knochensack“ designated light green parachute blouse. He wears the steel helmet M38 specially developed for paratroopers with gray-green helmet cover. The cartridge Bandulier took 100 cartridges (7.92 × 57 mm) for the carabiner 98k which is also recognizable in the picture. At his paddock he wears a holster for the pistol 08 (Luger). At least one of the strapped bags is likely to be the bag made of cloth for the gas mask and the other may be a bag for stalk grenades. He already wears the second variant of the combat boots, which have not like his predecessors the lacing laterally, but in the middle. Detailed information about the date and location are not available at the moment. It can be assumed that the photo could have been taken at the beginning of 1941. 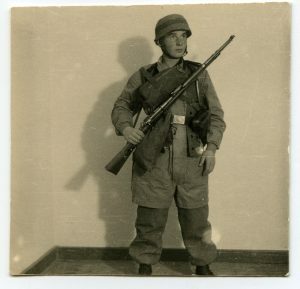 Mit dem heutigen Foto zeigen wir ein schönes Soldatenportrait. Es handelt sich hier im Bild um den deutschen Fallschirmjäger Heinz Besecke. 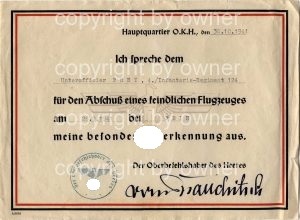 Dieser trat seinen Dienst Anfang November 1937 bei dem (Flak) Regiment General Göring an und war anschließend Angehöriger der 2. Kompanie, I. Bataillon des Fallschirmjäger-Regiment 1. Dessen Einheit war unter anderem bei der Besetzung der Brücken von Dordrecht in Holland im Mai 1940 beteiligt. Zwischenzeitlich Ende Mai 1940 nach Trondheim/Norwegen verlegt, erfolgte vom 20. – 29. Mai 1941 der Einsatz bei der Eroberung der Insel Kreta. Er trägt die für diese Zeit übliche Einsatzuniform eines Fallschirmjägers. Markant hierbei ist natürlich die umgangssprachlich als „Knochensack“ bezeichnete hellgrüne Fallschirmschützen-Bluse. Er trägt den für Fallschirmjäger speziell entwickelten Stahlhelm M38 mit graugrünem Helmüberzug. Das umgehängte Patronen-Bandulier fasste 100 Patronen (7,92 × 57 mm) für den ebenfalls im Bild erkennbaren Karabiner 98k. An seinem Koppel trägt er ein Holster für die Pistole 08 (Luger). Mindestens eine der umgeschnallten Beutel dürfte die aus Stoff gefertigte Tasche für die Gasmaske und die andere eventuell eine Tasche für mitgeführte Stielhandgranaten sein. Er trägt bereits die zweite Variante der Springerstiefel, die nicht wie seine Vorgänger die Schnürung seitlich, sondern vorne mittig haben. Konkrete Angaben zum Aufnahmedatum und Ort liegen momentan leider nicht vor. Es ist anzunehmen, dass das Foto Anfang 1941 entstanden sein könnte. heute möchte ich mal einen kleinen Marinenachlass vorstellen. Trotz der wenigen Dokumente hat der geschichtliche Hintergrund doch eine größere Tragweite als auf den ersten Blick vermuten lässt. III. Verstorbenen, die die Voraussetzungen erfüllt oder annähernd erfüllt haben, kann das Abzeichen nur verliehen werden, wenn Ihr Tod die Folge einer Verwundung, eines Unglücksfalles oder einer Erkrankung ist, welche sie während der Feindfahrt erlitten bzw. sich zugezogen haben. IV. An Besatzungen der sonstigen mit den Flottenstreitkräften eingesetzten Schiffe darf das Flottenkriegsabzeichen nur verliehen werden, wenn solche Schiffe in Verbindung mit Seestreitkräften mit Kampfaufgaben betraut waren. V. Das Flottenkommando wird ermächtigt, die vorstehend gegebenen Bedingungen, nötigenfalls im Benehmen mit dem Kommandierenden Admiralen Nord und Ost, zu ergänzen. Diese Voraussetzungen wurden über die Jahre erweitert und verändert, so das später weiter Marinesoldaten mit dem Abzeichen beliehen werden konnten. Den größten Teil ihrer Dienstzeit war die Tirpitz nach dem sogenannten Präsenzflotte-Konzept in Norwegen stationiert und bedrohte von dort allein durch ihre Existenz die alliierten Geleitzüge nach Murmansk. Gegebenenfalls sollte sie helfen, eine alliierte Invasion in diesem Gebiet abzuwehren. Nach mehreren vergeblichen Angriffen auf die Tirpitz wurde sie am 12. November 1944 bei einem Luftangriff der Royal Air Force im Sandnessund, einer Meerenge südwestlich der Insel Tromsøya, zum Kentern gebracht. Das Wrack wurde in den 1950er Jahren von einem norwegischen Bergungsunternehmen vor Ort verschrottet…..
Am 6. 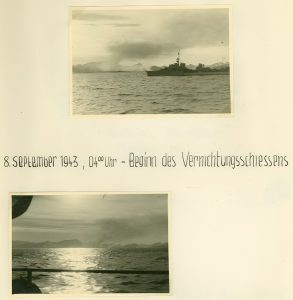 September 1943 lief aus dem Altafjord am Nordkap in Norwegen eine aus den Schlachtschiffen Tirpitz und Scharnhorst sowie neun Zerstörern bestehende deutsche Kampfgruppe aus. Sechs der Zerstörer hatten ein Bataillon mit etwa 600 Mann des Grenadierregiments 349 an Bord. Zweck des Unternehmens war die Zerstörung der Funk- und Wetterstation, des Elektrizitätswerks und der Kohleförderanlagen auf Spitzbergen. Zwei Tage später, am 8. September gegen 3:30 Uhr früh, trennte sich der Verband. Die Scharnhorst und die sechs Zerstörer der 5. und 6. Zerstörer-Flottille liefen zum Grønfjord und Adventfjord, wo die mitgeführten Truppen ab etwa 7:00 Uhr ausgeschifft wurden. Die Tirpitz und die 4. Zerstörer-Flottille begannen zu diesem Zeitpunkt mit der Beschießung von Barentsburg und Umgebung, was die norwegischen Verteidiger schließlich zum Rückzug ins Hinterland zwang, während die Scharnhorst und ihre Zerstörergruppe Longyearbyen beschossen. Die deutschen Sprengtrupps zerstörten die wichtigen Anlagen, steckten die Kohlenhalden in Brand und gingen nach knapp drei Stunden wieder an Bord. Der deutsche Verband kehrte in den Altafjord zurück, wo er am 9. September eintraf. Auf den deutschen Schiffen gab es durch die norwegische Gegenwehr allerdings Schäden und mehrere Tote. Z 29 erhielt vier Treffer vom Kaliber 10 cm, davon zwei in die Außenhaut, und hatte drei Tote zu beklagen. Z 31 erhielt 8 oder 10 Treffer und hatte ein Todesopfer. Z 33 wurde 36 mal getroffen und hatte ebenfalls drei Tote. Auf dem Rückmarsch fuhren Z 29 und Z 33 wegen der Löcher im Rumpf und ihrer dadurch verminderten Seefähigkeit in Lee der beiden Schlachtschiffe. Bereits am 19. Oktober setzten der amerikanische Schwere Kreuzer Tuscaloosa sowie drei britische und ein amerikanischer Zerstörer norwegische Truppen auf Spitzbergen ab, um den Stützpunkt wiederherzustellen. Schon im Winter 1943 stand und operierte die Wetterstation der Alliierten wieder. Anzumerken ist das die Stadt Longyearbyen nahezu vollständig zerstört wurde. Der durch eine dabei in Brand geschossene Schachtanlage entstandene Schwelbrand konnte erst 1963 !!!!! erstickt werden. Auch sehr Bemerkenswert ist die Operation Sizilien aber durch die Tatsache, dass sie den einzigen echten Kampfeinsatz der TIRPITZ unter Einsatz ihrer schweren Artillerie bedeutete. Sie verschoss während des Einsatzes 52 Schuss des Kalibers 38cm und 82 Schuss des Kalibers 15cm. 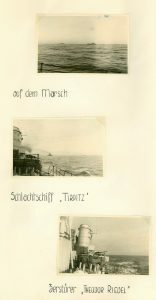 Einem glücklichen Umstand zu verdanken ist die Tatsache das ich beim durchsuchen meines Archives zufällig auf einige von mir eingescannte Seiten eines Fotoalbums gestoßen bin, das eben dies Kampfgruppe beim Angriff auf Spitzbergen zeigt. Bei diesem Unternehmen erhielt der Soldat auch das Eiserne Kreuz 2. Klasse für Tapferkeit am 12. September 1943. Die Urkunde zum Flottenkriegsabzeichen sowie die Urkunde zu Eisernen Kreuz 2. Klasse wurden beide durch Admiral Oskar Kummetz unterschrieben. Abgerundet wird diese kleine Gruppe durch die Verleihung der Tirpitz Nadel. Diese Nadel wurde an verdiente Soldaten des Schlachtschiffe Tirpitz verliehen. Dieser Marinesoldat war insgesamt 38 Monate auf der Tirpitz und wurde dann 1944 zur Ubootwaffe versetzt. Der Auftrag für das Boot wurde am 25. September 1939 an die Werft Deutsche Werke, Kiel vergeben. Die Kiellegung erfolgte am 16. November 1939, der Stapellauf am 18. Mai 1940. Die Indienststellung unter Oberleutnant zur See Herbert Wohlfarth fand schließlich am 15. Juni 1940 statt. Das Boot gehörte nach seiner Indienststellung am 15. Juni 1940 bis zum 31. 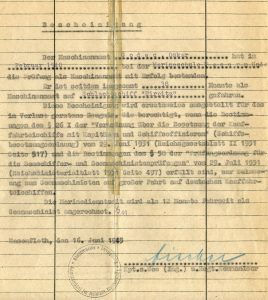 August 1940 als Ausbildungsboot zur 1. U-Flottille in Kiel. Nach der Ausbildung gehörte U 137 vom 1. 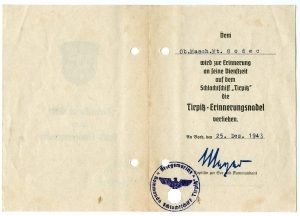 September 1940 bis zum 19. Dezember 1940 als Frontboot zur 1. U-Flottille in Kiel. Nach dem Fronteinsatz kam das Boot vom 20. Dezember 1940 bis zum 5. Mai 1945 als Schulboot zur 22. U-Flottille nach Gotenhafen bzw. Wilhelmshaven. (Es wurde zum Krieg gegen die Sowjetunion von Juni 1941 bis August 1941 als Frontboot reaktiviert). U 137 unternahm während seiner Dienstzeit fünf Feindfahrten, auf denen es sechs Schiffe mit 24.136 BRT versenken und zwei Schiffe mit 15.469 BRT beschädigen konnte. Der Soldat Godec überlebte den Krieg und lebte mit seiner Familie noch viel Jahre glücklich zusammen. PS: Durch die Hilfe einiger Sammler kann ich nun tatsächlich eines der wenigen Originalstücke hier vorstellen. Die Tirpitznadel ! 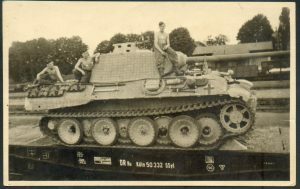 In today’s photo we see a rail transport of a german tank ‘Panzerkampfwagen V „Panther“’ (Sd.Kfz.171). The tank is a so-called ‘Ausführung A’ (Ausf.A), the second variant of the series production of this type (further variants Ausf.D and G). Based on various details that have arisen in the course of production due to changes and improvements, one can determine the production period of this vehicle at least from November 1943. On the front plate of the hull (Glacis), the armoured ball mount (Kugelblende) for the radio operators machine gun is already recognizable. This was installed in the current production from November ’43 by factory. The installed MG 34 is protected with a dark cover. The tank already carries in September 1943 introduced „Zimmerit“, a concrete-like anti-mine adhesive coating. This coating was apparently applied at the factory with a uniform pattern on all vertical surfaces of the tank. The shape of the Zimmerit pattern suggests that the vehicle is at either M.N.H. (Maschinenfabrik Niedersachsen Hannover) or M.A.N. (Maschinenfabrik-Augsburg-Nuremberg) has been manufactured. The vehicle apparently has no camouflage paint and is only painted with a dark yellow base color (Dunkelgelb RAL7028). Turret numbers are evidently not recognizable on the side of the turret, but smaller paint remains indicate that the vehicle could have previously carried large numbers. At the guide ring of the commander’s cupola, the bracket (Fliegerbeschussgerät 41) for the anti-aircraft machine gun (MG) is recognizable. The associated MG is not installed. On the holder a small plugged flag is recognizable. On the properly fitted tools located in the area of ​​the bolt cutter a steel helmet of a crew member is visible. The tank was certainly equipped with side skirts (12 pieces), which were reduced due to the longer rail transport and probably stowed under the vehicle. The photo is from a member of the Panzer Regiment 25 (I./Pz.Rgt.25). In view of the summer weather and the permissive clothing of the crew, the photograph could have been taken around the 15.07.1944, during transport to the eastern front towards Kaunas / Lithuania. Im heutigen Foto sehen wir einen Bahntransport eines deutschen Panzer ‘Panzerkampfwagen V „Panther“’ (Pz.Kpfw. V, Sd.Kfz.171). Bei dem Panzer handelt es sich um eine sogenannte Ausführung A (Ausf.A), der zweiten Variante aus der Serienproduktion dieses Typs (weitere Varianten Ausf.D und G). Anhand verschiedener Details, die sich im Laufe der Produktion anhand von Veränderungen und Verbesserungen ergeben haben, kann man den Produktionszeitraum dieses Fahrzeugs mindestens auf ab November 1943 bestimmen. An der Frontplatte der Wanne (Glacis) ist bereits die Kugelblende für das Funker-MG erkennbar. Diese wurde in der laufenden Produktion ab November ’43 ab Werk verbaut. Das verbaute MG 34 ist mit einer dunklen Hülle geschützt. Der Panzer trägt bereits das im September 1943 eingeführte „Zimmerit“, eine betonartige Anti-Minen-Haftbeschichtung. Diese Beschichtung wurde augenscheinlich werkseitig mit einem gleichmäßigen Muster an allen senkrechten Flächen des Panzers aufgetragen. Die Form des Zimmerit-Musters lässt darauf schließen, dass das Fahrzeug entweder bei M.N.H. (Maschinenfabrik Niedersachsen Hannover) oder bei M.A.N. (Maschinenfabrik-Augsburg-Nürnberg) gefertigt worden ist. Das Fahrzeug trägt augenscheinlich noch keinen Tarnanstrich und ist lediglich mit dunkelgelber Grundfarbe (RAL7028) bemalt. Turmnummern sind augenscheinlich an der Seite des Turmes nicht erkennbar, jedoch zeugen kleinere Farbreste davon, dass das Fahrzeug zuvor große Ziffern getragen haben könnte. Am Führungsring oberhalb der Kommandantenkuppel, ist die Halterung (Fliegerbeschussgerät 41) für das Flugabwehr-MG erkennbar. Das zugehörige MG ist nicht verbaut. An der Halterung ist ein kleines aufgestecktes Fähnchen erkennbar. An den vorschriftsmäßig angebrachten Werkzeugen befindet sich im Bereich des Bolzenschneiders ein Stahlhelm eines Besatzungsmitglieds. Der Panzer war mit Sicherheit mit Seitenschürzen (12 Stück) ausgestattet, die aufgrund des längeren Bahntransportes abgebaut und vermutlich unter dem Fahrzeug verstaut worden sind. Das Foto stammt von einem Angehörigen des Panzer Regiment 25 (I./Pz.Rgt.25) und könnte angesichts des sommerliches Wetters und der freizügigen Bekleidung der Besatzung um den 15.07.1944 beim Transport an die Ostfront in Richtung Kaunas/Litauen entstanden sein. during this cold and dark winter I have more time for checking the net for interesting badges. A few days ago I stumbled over a General Assault Badge with a screw back. Not a normal screw back as most of you know from Iron Crosses first class. I talk about the seashell screw back version. In Germany we use the term “Sternenschraubscheibe” which means star screw back. My collector friend Gabin Bruneau from France is the proud owner of that nice GAB. I asked for some pictures and more details about the badge and here we go. The measurements of the badeg are: 540 mm high and 445 mm wide. The screwback itself has 410 mm. 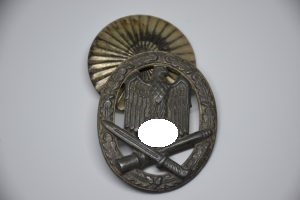 Well, Alois Rettenmaier and seashell……maybe you remember seeing Infantry Assault Badges made by Rettenmaier before with this sort of backside. 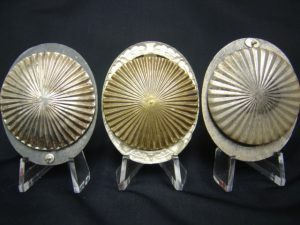 I started to search the net for more badges with clamshell screw backs and found some. In the Luftwaffen Badge area I found some pilot badges, sadly just with normal screw backs, Kriegsmarine was the same, no luck there. Only one Uboat Badge but I think that was not a good one with the screw back….. 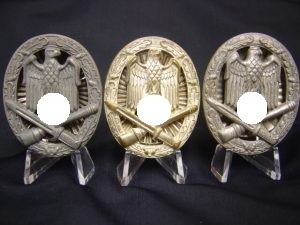 So I went on and found wounded badges from World War I with clamshells, Iron Crosses 1st class 1914 and Iron Crosses 1st class 1939 with that clamshell. Even on the clasp for the iron cross 1939 1st class we found them…..So they are out there but you have to be careful: Bad guys already know that the price goes up if there is a screw back instead of a pin….even better a seashell……watch out and get good information before you buy. And here are the pictures to the different GAB makers. The General Assault badge was introduced on June 1st, 1940 by Generaloberst Walther von Brauchitsch, for award to support personnel who were ineligible for the Infantry or Panzer Assault badges. Criteria for award of the badge was basically the same as the criteria for award of the Infantry and Panzer Assault badges with the main qualification being participation in three separate assaults in a supporting role. On its introduction the badge was only intended for award to combat engineers and was designated, Pionier-Sturmabzeichen, (Engineer’s Assault Badge). Shortly afterwards award of the badge was extended to other support personnel including artillery and assault gun personnel, anti-tank and anti-aircraft personnel and medical personnel. Of Note: Before the introduction of the Tank Destruction Strip in March 1942, personnel who had single handedly destroyed an enemy tank with Infantry weapons were awarded the General Assault Badge. Thanks again to all collectors who provided me with picture material. Some pictures are without any source, so if that is from your collection let me know. So I can credit it to your name. Hope that the clam shell information was good for your hobby! Here we can see in the photo a German submarine type XXI, one of the most modern submarines of its time. 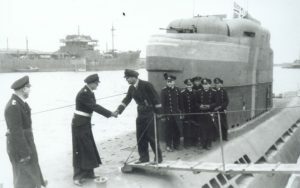 Submarines of this type were manufactured from April 1944 to January 1945 at the shipyards of Blohm & Voss in Hamburg, at the Deschimag AG Weser in Bremen and by the Schichau Works in Gdansk in a number of about 131 and also after the war by the British, French and Soviets continue to be used. The boat shown here in the picture is supposed to be U 3034, which was layed on keel an built at the Deschimag AG Weser in Bremen on November 14th, 1944 and could not be put into service until March 31st , 1945 due to damage caused by an air raid. It served until May 05th, 1945, the day of his self-sinking as a training boat of the 4th U-Flotilla (training flotilla) and was therefore never in combat. Commander of this boat were until the beginning of April 1945 First-Lieutenant Wilhelm Prehn and later First-Lieutenant Horst Willner, who sank the boat on the morning of May 5th, 1945 in the Geltinger Bay, so it could not fall into Allied hands. A total of 47 submarines were sunk in the bay on the night of May 4th to May 5th due to the so-called „Regenbogen-Befehl“ (“Rainbow” Order). U 3034 was lifted in 1946 and scrapped. In the photo, among other things, several officers, probably crew members of the boat, at the front of the command tower are recognizable. Standing on the access bridge, a lieutenant-commander is recognizable, who probably visits the boat and its crew. He wears as decorations visible the ‘Minesweeper War Badge’ and the ‘Destroyer War Badge’. The officer who welcomed the lieutenant-commander on board might be the commander, that is, Prehn or Willner. First-Lieutenant Horst Willner later became known by the fact that under the command of U 3505 between 22.03.-26.03.1945 from Gotenhafen/Gdansk and Hela over 50 refugees (other sources also mention 110 civilians and as a period 28.03.-02.04.1945 ), including women, children and youth of the HJ (Hitler Youth) took on board to bring them to Lübeck Travemünde and thereby save from the advancing Soviets. Among the refugees were his wife and his newborn daughter. After U 3505 had been sunk on April 3rd, 1945 by a heavy air attack in the port of Kiel, took over Willner and his crew substitute U 3034. The boat had two Flak towers, each with 2x 2cm Flak C / 38, which were installed in the front and rear of the command tower and were able to swivel horizontally up to 240 ° and vertically up to + 45 ° / -5 °. The boat is marked on the tower with large stripes, alongside and vertically, by means of yellow paint. It has been preserved with ex U 2540 until today only a single submarine of this type and can be visited in Bremerhaven as a museum ship. The location and the date on which the photo was taken, we are not yet known, so we would like more information would be very welcome. Wir erkennen hier auf dem Foto ein deutsches U-Boot vom Typ XXI, einem der modernsten Unterseeboote der damaligen Zeit. U-Boote dieses Typs wurden ab April 1944 bis Januar 1945 bei den Werften von Blohm & Voss in Hamburg, bei der Deschimag AG Weser in Bremen und durch die Schichau-Werke in Danzig in einer Stückzahl von etwa 131 gefertigt und auch nach Kriegsende durch die Briten, Franzosen und Sowjets weiter verwendet. Bei dem hier im Bild erkennbaren Boot soll es sich um U 3034 handeln, welches bei der Deschimag AG Weser in Bremen am 14.11.1944 auf Kiel gelegt und aufgrund von Beschädigungen durch einen Luftangriff erst am 31.03.1945 in Dienst gestellt werden konnte. Es diente bis zum 05.05.1945, dem Tag seiner Selbstversenkung als Ausbildungsboot der 4. 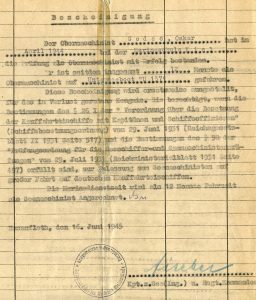 U-Flottille (Ausbildungsflottille) und war somit nie im Kampfeinsatz. Kommandanten dieses Bootes waren bis Anfang April 1945 Oberleutnant Wilhelm Prehn und anschließend Oberleutnant Horst Willner, der das Boot am Morgen des 5.Mai 1945 in der Geltinger Bucht versenkte, um es nicht den Alliierten in die Hände fallen zu lassen. Es wurden in der Bucht insgesamt 47 U-Boote in der Nacht vom 4. zum 5. Mai aufgrund des sogenannten “Regenbogen-Befehl” selbst versenkt. U 3034 wurde 1946 gehoben und abgewrackt. Auf dem Foto sind unter anderem mehrere Offiziere, vermutlich Besatzungsmitglieder des Bootes, am vorderen Bereich des Turmes erkennbar. Auf der Zugangsbrücke stehend, ist ein Kapitänleutnant erkennbar, der vermutlich das Boot und seine Besatzung besucht. Er trägt als Auszeichnungen das Kriegsabzeichen für Minensuch-, U-Boot-Jagd- und Sicherungsverbände und das Zerstörer-Kriegsabzeichen. Bei dem Offizier der den Kapitänleutnant an Bord begrüßt, könnte es sich um den Kommandanten, also um Prehn oder um Willner handeln. Oberleutnant Horst Willner wurde später dadurch bekannt, dass er unter dem Kommando von U 3505 zwischen 22.03.-26.03.1945 von Gotenhafen/Danzig und von Hela über 50 Flüchtlinge (anders lautende Quellen nennen auch 110 Zivilisten und als Zeitraum 28.03.-02.04.1945), darunter Frauen, Kinder und Jugendliche der HJ an Bord nahm, um sie nach Lübeck-Travemünde zu bringen und dadurch vor den anrückenden Sowjets zu retten. Unter den Flüchtlingen befanden sich auch seine Frau und seine neugeborene Tochter. Nachdem U 3505 am 03.04.1945 durch einen schweren Luftangriff im Hafen von Kiel versenkt worden war, übernahm Willner und seine Besatzung ersatzweise U 3034. 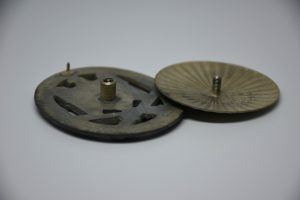 Das Boot verfügte über zwei Flaktürme mit jeweils 2x 2cm Flak C/38, die im vorderen und hinteren Bereich des Kommandoturmes verbaut und horizontal bis zu 240° und vertikal bis zu +45°/-5° schwenkbar waren. Das Boot ist am Turm mit großen Streifen, längsseits und senkrecht, mittels gelber Farbe markiert. Es hat sich mit ex U 2540 bis heute nur ein einziges U-Boot dieses Typs erhalten und kann in Bremerhaven als Museumsschiff besichtigt werden. Der Aufnahmeort und das Datum an dem das Foto entstanden ist, sind uns bisher nicht bekannt, sodass uns weitere Informationen hierzu sehr willkommen wären. Es handelt sich bei dieser Anerkennungsurkunde um eine der seltensten Auszeichnungen der Deutschen Wehrmacht. Diese Urkunde wurde lediglich 591-mal verliehen und ist nur in ganz wenigen Fällen erhalten geblieben. Die Anerkennungsurkunde wurde verliehen für den Abschuss von feindlichen Flugzeugen mit Infanteriewaffen, also Karabiner, Maschinenpistole und Maschinengewehr. Es existieren 2 unterschiedliche Typen von Urkunden. 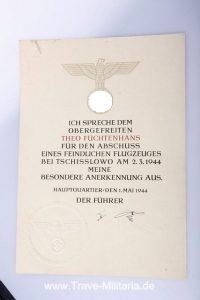 Der erste Urkundentyp der Anerkennungsurkunde des Oberbefehlshabers des Heeres für Flugzeugabschüsse ist mit Originalunterschrift von Generalfeldmarschall von Brauchitsch versehen und wurde erstmalig in meinem Buch „Das Panzervernichtungsabzeichen sowie das Tieffliegervernichtungszeichen“ veröffentlicht. Bis zu diesem Zeitpunkt konnte über das Aussehen dieser Urkunde nur spekuliert werden. Der Autor Veit Scherzer hat in seinem Buch „Die Inhaber der Anerkennungsurkunde des Oberbefehlshabers des Heeres für Flugzeugabschüsse 1941 – 1945“ die Vermutung geäußert, dass die Urkunden im Verleihungszeitraum bis 19.12.1941 – Tag der Entlassung des Generalfeldmarschall von Brauchitsch als Oberbefehlshaber des Heeres – sehr ähnlich den Anerkennungsurkunden für hervorragende Leistungen auf dem Schlachtfeld des 1. Typs waren. Mit dieser Vermutung hat er Recht. Hinsichtlich der sehr komplexen Verleihungsbedingungen für die Anerkennungsurkunden für den Abschuss von Flugzeugen sei der Leserschaft das sehr ausführliche und im Detail recherchierte Buch von Veit Scherzer zu empfehlen. Die Anerkennungsurkunde wurde lediglich 591-mal in der Zeit von September 1941 bis Februar 1945 verliehen, davon 285 an Einzelpersonen des Heeres und der Waffen-SS und 306 an Einheiten des Heeres und der Waffen-SS. des 1. Typs – mit Original Unterschrift von Brauchtisch – verleihen. Er schoss am 20. September 1941 ein feindliches Flugzeug bei Fein (Südabschnitt der Ostfront) ab. Unteroffizier Frey diente bei der 4. Kompanie, Infanterie-Regiment 124, 72. Infanterie-Division und war unter anderem auch mit dem Eisernen Kreuz 2. und 1. Klasse, sowie dem Infanteriesturmabzeichen beliehen. Dem Obergefreiten Theo Füchtenhans wurde am 1. Mai 1944 eine Urkunde des 2. Typs mit Unterschrift von Adolf Hitler verliehen, er schoss am 2. März 1944 ein Flugzeug bei Tschisslowo ab. Gefreiter Füchtenhans diente in der 8. Kompanie des Grenadier-Regimentes 551, 329. Infanterie-Division. Die Urkunde trägt die faksimilierte Unterschrift Adolf Hitlers als Oberbefehlshaber der Wehrmacht, sie wurde mit einem Blindprägesiegel versehen. Es wurden nicht nur an Einzelpersonen Anerkennungsurkunden verliehen, für den gemeinschaftlichen Abschuss eines Flugzeuges wurden Urkunden an Einheiten verliehen. Leider liegt mir keine Urkunde der Verleihung an eine Einheit zur Veröffentlichung in diesem Blog vor, so dass auf mein Buch verweise, in dem eine Urkunde an die Leichte Fahrkolonne 9/194 gezeigt wird. Eine äußerliche Kenntlichmachung der Beliehenen in Form einer tragbaren Auszeichnung erfolgte bis zum Jahre 1945 nicht. 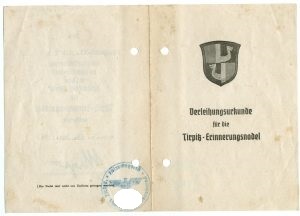 Im Reichsgesetzblatt Teil 1 vom 14.02.1945 wurde die Einführung eines Tieffliegervernichtungsabzeichens bekannt gegeben. 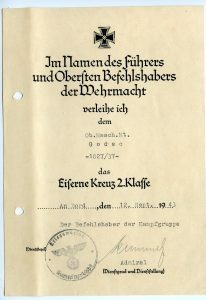 Die Stiftung des Abzeichens war am 12.02.1945. Nachfolgend ist das Reichsgesetzblatt abgebildet. 1. Das Sonderabzeichen wird an Soldaten verliehen, die in diesem Kriege mit Handwaffen (Gewehr, Maschinenpistole oder M.G. Ka. 1,2 cm und kleiner) einen feindlichen Tiefflieger abgeschossen haben. Für jedes abgeschossene Flugzeug wird an den entscheidend beteiligten Einzelschützen ein Sonderabzeichen verliehen. 2. Das Abzeichen besteht aus einem Band aus Aluminiumgespinst von 90 mm Länge und 32 mm Breite mit 2 eingewirkten schwarzen Streifen (3 mm breit), auf dem die aus Blech gestanzte Silhouette eines Flugzeuges in Schwarz angebracht ist. 3. Der Ärmelstreifen wird auf dem rechten Oberärmel der Feldbluse getragen. Bei erneuter Verleihung wird ein weiterer Ärmelstreifen angelegt. An Stelle von 5 Abschüssen ist ein Abzeichen in Gold zu tragen. 4. Das Sonderabzeichen wird durch Truppenführer mindestens im Range eines selbständigen Brigade-Kommandeurs auf schriftlichen Vorschlag des Einheitsführers durch Tagesbefehl verliehen. 5. Tag der Verleihung ist in die Personalpapiere einzutragen. Beglaubigte Abschrift des Tagesbefehls ist den Beliehenen auszuhändigen. 6. Die Lieferung der Abzeichen wird dem Wehrmachtbeschaffungsamt (Bekleidung und Ausrüstung übertragen. Zusätze des Oberkommandos des Heeres zu den Durchführungsbestimmungen des O.K.W. zur Verordnung über die Stiftung des Tieffliegervernichtungsabzeichens. Zu. 1. Einzelschützen, denen die bisherige Anerkennungsurkunde des Führers für den Abschuss feindlicher Flugzeuge mit Infanteriewaffen verliehen wurde, ist das Abzeichen nachträglich auszuhändigen. Ist nicht einwandfrei zu klären, wem der Abschuß zuzuschreiben ist, so muß von der Verleihung abgesehen werden. Danke and die Firma www.trave-militaria. de für die Überlassung des Bildmaterials Nachlass Fürchtehans.